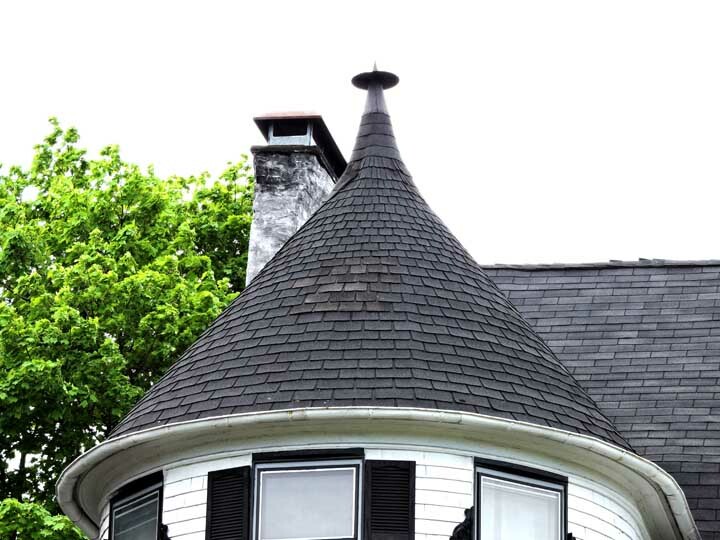 Conical roof with finial atop tower. 3-story cross gambrel frame house with mixed Queen Anne and Shingle Style influences, wood clapboard and shingle, asphalt roof. Engaged 3-story curved tower with conical roof, large entry porch with spindle balustrade, shed roof entry pavilion with casket doors. 2-story polygonal bay under large front gable with central recessed Palladian window with columns flanked by bulls-eye windows. Side elevation features balcony at 3rd story. 1/1 double hung wood windows typical. Contains contributing secondary building hipped roof frame building (garage). The single house at 65 Bidwell Parkway is set on a shortened irregular trapezoidal lot, located on the south side of the street, at its south end. Bidwell Parkway is a residential boulevard that runs on a sharp northeast diagonal between Colonial Circle and Soldiers Circle (outside the survey area at the intersection of Lincoln Parkway). A component of Olmsted and Vaux’s original parkway system, it was once one of the most prestigious addresses within the survey area, if not the entire city, and the location of many fine individual homes. The property is located in a residential area of the east central section of the Grant-Ferry-Forest neighborhood. 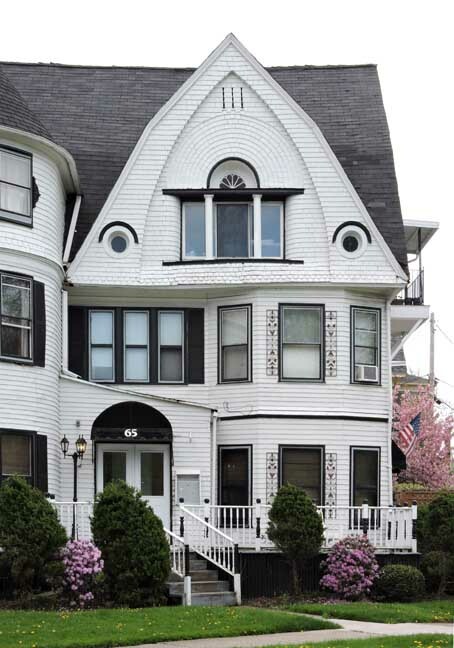 A three-story, side and lower front gambrelled, urban, frame, residence of Shingle styling. It has a rough squared plan, slightly elled by the large side tower and extension. The facade has a full-width, open porch with open wood rail, that extends flat across the western 3⁄4’s of the facade to wrap around the three-story, extended bay and engaged tower that dominates the far east bay of the facade. The paired main entrance doors with awning are located on the flat of the façade, off center to the east, set within a side oriented, shed roofed enclosed, rectangular vestibule that butts into the east bay tower. A two-story polygonal bay with tiered triple windowing occupies the west bay of the facade. A triple window group sets to the east on the second floor facade, above the entrance vestibule. Upper story contained within the gambrels. 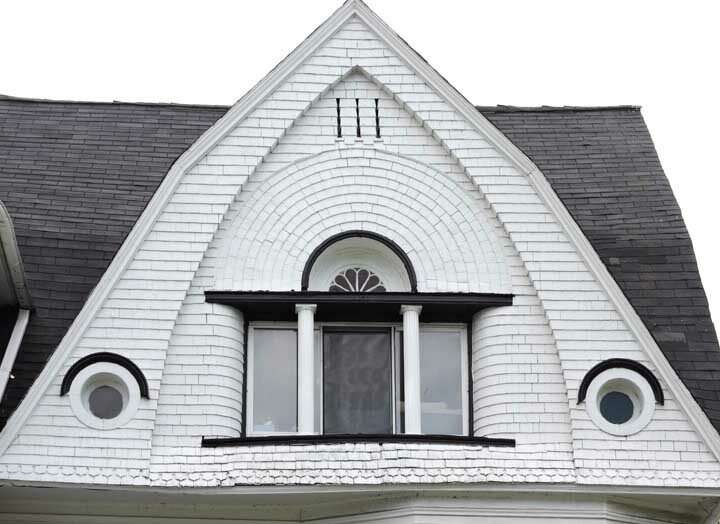 Lower front gambrel defines the eastern 3⁄4’s of the upper facade; gambrel accented by two symmetric circular oculus at the sides and a shaped center recession with recessed Palladian window and decorative shingle patterns. West elevation has a first-story, roofed, polygonal bay to the rear, several first-story windows with awnings, single shuttered second-story window, and centered upper-story balcony with large brackets, flat roof, and metal rail. Brick chimney visible at the eastern valley junction of tower and main roof. Exterior wall fabric is wood clapboard and shingle. 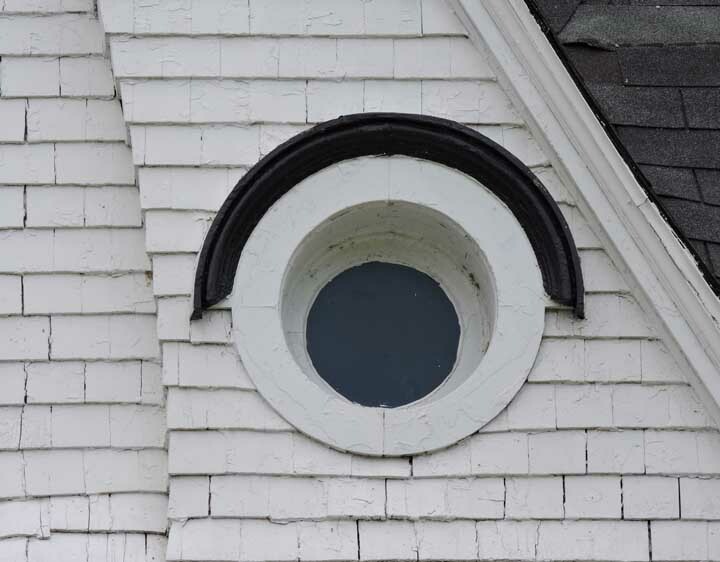 Fenestration is primarily one-over-one double-hung wood sash and fixed. 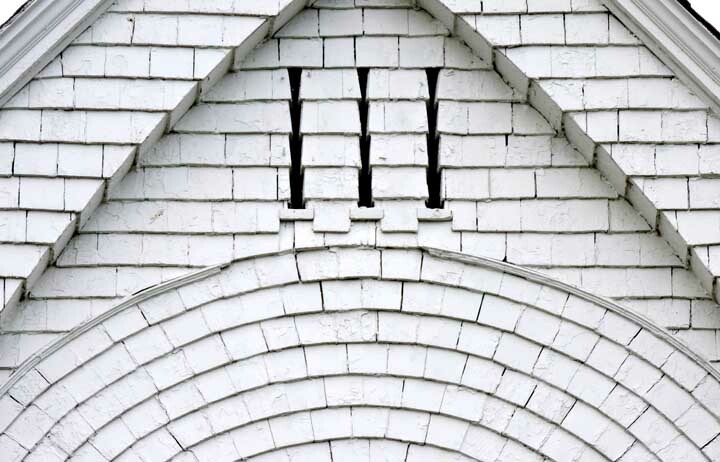 Additional detailing includes modest frieze, belt course, shuttering, and framing. 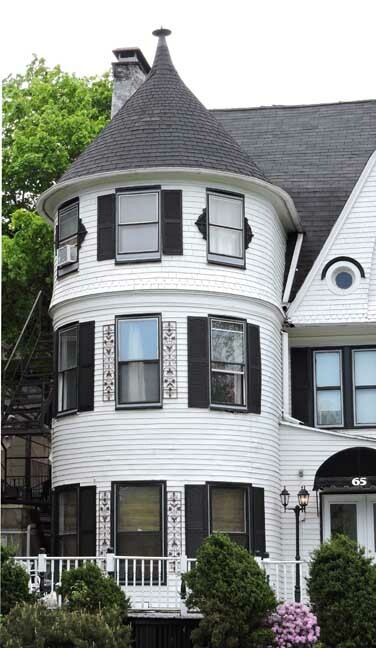 The building at 65 Bidwell Parkway is significant as a good representative example of a three-story, side and lower front gambrelled, urban, frame, residence of Shingle styling. 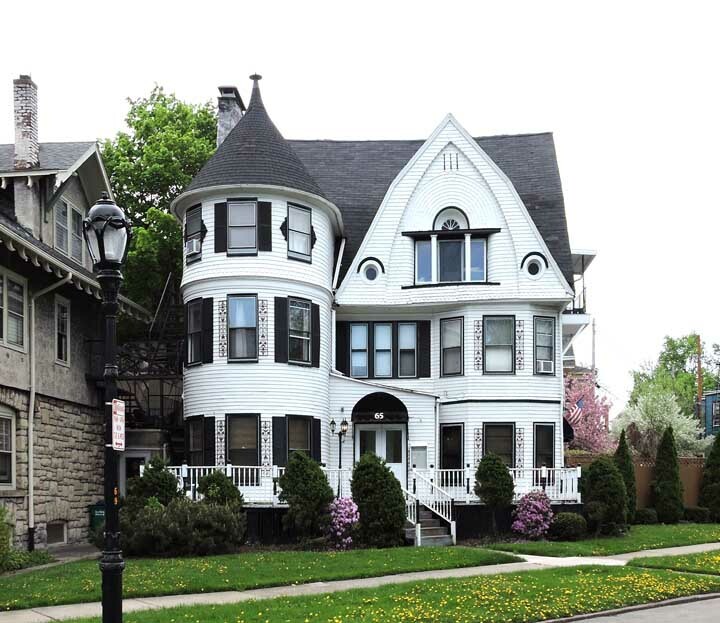 A style characteristic of early twentieth century residences, though fairly unique in the Buffalo Grant-Ferry-Forest neighborhood in which singles and urban doubles of Queen Anne style abound. One of several fine Shingle examples in the survey area. A Contributing building to the Richmond Avenue - Ashland Avenue Historic District.